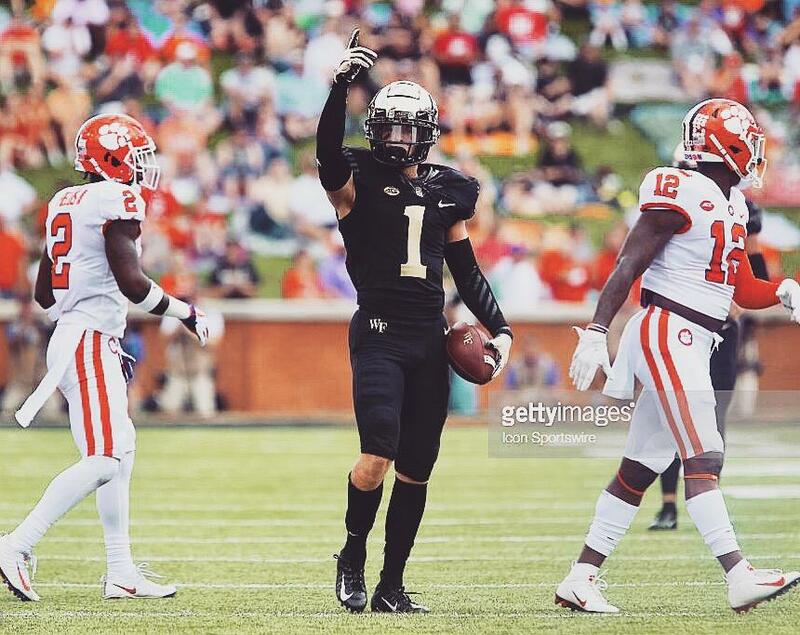 As a senior on the Wake Forest Football Team, Alex Bachman has been a source of consistency for the Demon Deacons throughout his four years with the program. For the 2018 season, Bachman has caught 30 receptions, 370 receiving yards, and six touchdowns for the Demon Deacons in 2018, and the team will continue to rely on him as they prepare to face the Memphis Tigers in the Birmingham Bowl on Dec. 22. I was able to sit down with him to discuss the upcoming matchup, reflect on his college football career, and talk about his plans for the future. Lizzie Snyder: How does it feel to go to your third bowl game in three years and what does that say about the Wake Forest football program, the smallest power 5 in the country? Alex Bachman: I’m very excited. I would say because we have been building the entire four years that I’ve been here and if we didn’t go out with a bowl game, it would have been a disappointment for sure especially with the high expectations we had coming in at the beginning of the year. I can’t wait to get out and put on a uniform one more time. LS: Coming off a 6-6 regular season, how do you feel about being selected to play in the Birmingham Bowl against Memphis who went 8-5 for the regular season, but who lost to Tulane 40-24? AB: I don’t really look into records or who they played. I’m not just going to look to their loss to Tulane and assume that we’re better than them. I go into every game believing that we can win and so for me, it doesn’t really matter who they have played. We have to think about what we can control as a team and not really about our opponent. At the end of the day, if we execute what we’re working towards, the rest will take care of itself. LS: Speaking of injuries, how have you had to deal with injury this season? AB: *laughs* I pulled a hamstring after the second game and couldn’t play against Boston College. I got a knee contusion in the fifth game of the year. I sprained one ankle in practice and the other against Duke. I’ve had a bone bruise that I’ve been playing for for five games. I’ll deal with the injury at the end of the year. LS: What do you think are the biggest strengths of the team this season? Especially looking at the matchups against NC State and Duke? AB: I would say offensively, I think Jamie Newman has stepped up to the plate. He has come in composed and he had to deal with some adversity at the beginning of the season coming in expecting to be the starter, but he wasn’t, he’s a team player. He’s come out and played out really well for us, I think specifically against NC State and Duke. The game against Duke was not one person. Our entire defense played really well and they held the top offense to seven points and then offensively, we put up 50 points. Anytime you do that it is going to be a great win for us. LS: What has been the most challenging thing about being a student-athlete at Wake Forest? AB: Time management, for sure. Your entire schedule consists of tutors, meetings, practice, weights and all of that and how you balance it. If you focus on just one thing, you’re going to fail miserably. We have to wake up at five every morning and have to go to class after that. Having to go to class and stay awake, I’ve had to rely on coffee. I was not a coffee drinker before coming to Wake Forest. LS: As a senior, what advice would you give to an incoming freshman? AB: When you miss class, tutors, and meetings or if you’re late, you automatically put yourself in a situation where the coaches don’t want to play you because they don’t think you are responsible. Coaches will only play players who they think are reliable; they won’t rely on you to make big plays in the game if you can’t do any of that stuff. AB: Just take football as far as I can, honestly. I love sports, so when my football career comes to an end, then I would love to have a career in sports in some way whether that be broadcasting or sports business.